The NFL and other sports stadiums have rules banning all bags, purses, or backpacks over 4.5” x 6.5” in every professional football stadium. Some college stadiums have implemented similar rules, so you should check your specific venue's bag policy. Nobody wants to be THAT person carrying your phone and wallet around in a Ziploc bag! My advice — don't wait until you have tickets to a football game to shop for a purse you can take inside. The policy is here to stay, so if you've been hesitating, it's time to finally invest in a stadium-approved bag for your gameday wardrobe, so if you need it, you have it. Not too long ago, it was DIFFICULT to find a stylish stadium-approved bag that fit the policy's requirements, but that's not the case this season! I've spotted quite a few options online that you can work on gameday or every day if you like. 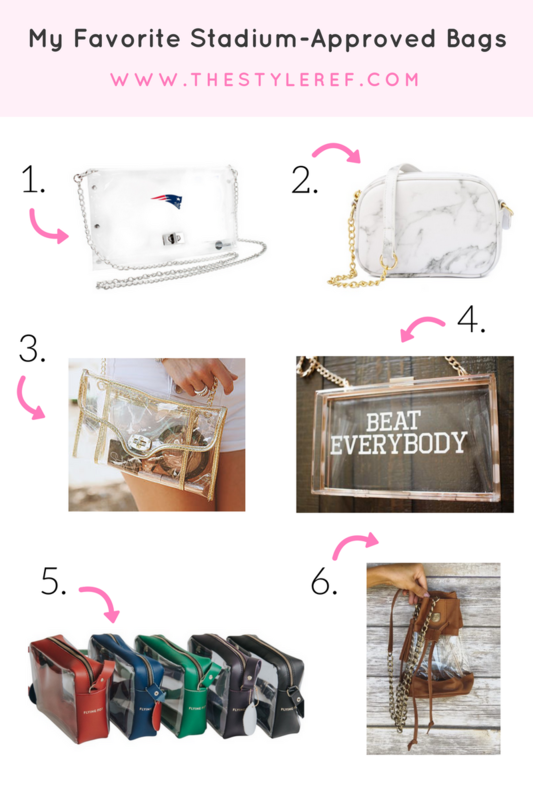 Since football season is just around the corner and you've already got enough on your to-do list, I put together a round-up of my favorite stadium-approved bags that'll get you swiftly through security in style. Make sure to get yours in time for kickoff! Which stadium-approved bag do you like best?